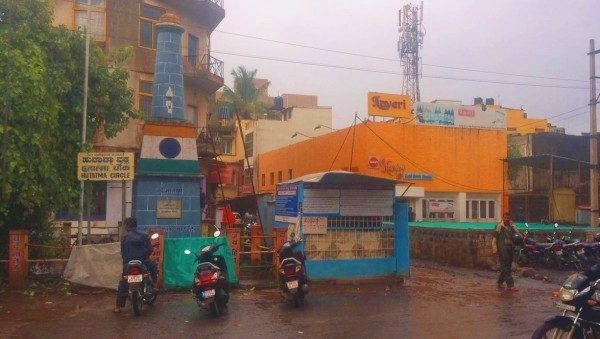 There is a monument amidst the busy main market in Belagavi build to pay homage to all the people who laid down their lives for the freedom of the country, this circle is named as Hutatma circle, the junction of Kirloskar Road, Ramdev Galli and Kadolkar Galli. Not many of you may have even noticed it. It has been ignored over the years by the Corporation and the Freedom fighters do make it a point to observe Independence Day, Republic day and August Kranti din at the memorial. A couple of years back on the request of the freedom fighters and a negligent city corporation the MLIRC had painted and cleaned the memorial. Now the City corporation after tremendous follow up has decided to renovate the structure and also its surroundings. The black cuddappa slab will be removed and pavered by cobble stones. Also the surroundings of the historic 12 pullyed well which is just adjacent to this memorial will also be pavered and 12 pulleys will be newly installed to relive those golden memories which earlier was the main source of water for the citizens before it was shut in early 1980s. The said well was rejuvenated last year. The memorial will also be cleaned and restored and repainted. The entire work is to be estimated at Rs.6,99,953.28 and work has to be completed in 3 months from date of order which will be somewhere after Independence day. The deadline to complete would have been before Independence Day, if it goes away, there are chances of delaying this…. the Amount may go in vain….